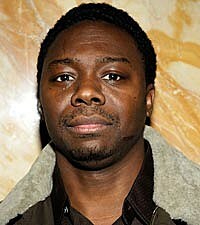 The long arm of the law has finally caught up with Jimmy "Henchman" Rosemond. The founder of Czar Entertainment was apprehended today (June 21) in New York City after a foot chase with authorities. The New York Post reports that DEA agents and U.S. Marshals spotted Henchmen outside of the W Hotel in Union Square. Henchmen ran northward before he was caught near the intersection of 21st St. and Park Ave. South, about four blocks from the W's location. Henchmen had been on the lam since a federal warrant was issued for his arrest back in May for his alleged involvement in a cocaine trafficking ring. Relying on two informants in Rosemond's organization, the DEA contends that he oversaw the shipment of hundreds of kilos of cocaine from Los Angeles to New York. The drugs were hidden in musical road cases being used under the guise of Czar Entertainment. Although Rosemond vigorously denied the charges against him, he never turned himself into authorities. Last week, inmate Dexter Isaac came forward saying it was Henchmen that paid him $2,500 to rob Tupac Shakur on the night he was shot in NYC's Quad Studios in 1994. Noble, a member of the Outlawz -- the group Tupac formed before his death -- spoke exclusively with the BoomBox and revealed that the West Coast rapper knew the shooter during the Quad Studios attack was indeed Isaac. Also last week, news broke of Rosemond's alleged ties to the murder of an associate of Tony Yayo. Rosemond, who counts rapper Game and former heavyweight boxing champion Mike Tyson among his management clients, is expected to be arraigned in Brooklyn federal court today.